Since we don't have a thread just for all the stuff happening out there, or related to out there (a shocking oversight that we must all chastise ourselves for--pass the wet noodle, comrades), here we be. Post it, comment on it, pictures are a plus. TAREGNA, India - The longest solar eclipse of the 21st century created near darkness in daytime, along a swath that stretched from India to China and the South Pacific. Millions gathered in the open to watch the spectacle, but millions more shuttered themselves inside their houses, gripped by fearful myths. One Hindu fable says eclipses are caused by a dragon-demon that swallows the sun, but modern-day astronomers have a less threatening explanation: They say the phenomenon occurs when the orbital mechanics are just right for the moon to cover the sun completely, casting a shadow on Earth. A thick cloud cover over India obscured the sun when the eclipse began at dawn, but parted in several Indian cities just minutes before the beginning of totality. "We were apprehensive of this cloudy weather, but it was still a unique experience with morning turning into night for more than three minutes," Amitabh Pande, a scientist with India's Science Popularization Association of Communicators and Educators, said after watching the eclipse. Thousands of Hindus took a dip in keeping with the ancient belief that bathing in the river at Varanasi, especially on special occasions, cleanses one's sins. The eclipse was seen there for 3 minutes and 48 seconds. The eclipse — visible only in Asia — moved eastward from India to Nepal, Myanmar, Bangladesh, Bhutan and China. Scientists had predicted the Indian village of Taregna would have the clearest view, and this was where thousands of scientists, nature enthusiasts and students gathered. The party was spoiled by thick clouds and overnight rains, but even that was welcome news for the agricultural area which has seen scant rainfall this monsoon season. "It would have been nice to see the solar eclipse, but the rain is far more important for us," said Ram Naresh Yadav, a farmer. At its peak over the Pacific, the total phase of the eclipse lasted 6 minutes and 39 seconds. That made it the longest-lasting total eclipse since July 11, 1991, when a stretch of totality lasting 6 minutes and 53 seconds was visible from Hawaii to South America. There will not be a longer total eclipse than Wednesday's until 2132. A 10-member team of scientists from the premier Indian Institute of Astrophysics in Bangalore and the Indian air force filmed the eclipse from an airplane, an air force press release said. But millions across India shunned the sight and planned to stay indoors. Even in regions where the eclipse was not visible, pregnant women were advised to stay indoors in curtained rooms, due to a belief that the sun's invisible rays would harm the fetus and the baby would be born with disfigurations, birthmarks or a congenital defect. Eclipse mania also gripped China. In Beijing, enthusiasts rushed to buy solar filters to watch the partial eclipse safely. "It's quite exciting," Chen Xintian said as she made her purchase. "I've never seen an eclipse before. It's a rare event, and I am very happy." The track of totality passed right through Shanghai, China's largest city. This led some observers to say that Wednesday's eclipse could have the largest potential audience in history. However, because of Shanghai's cloud cover, many residents couldn't see the actual eclipse above the morning darkness. The next total solar eclipse is due to occur on July 11, 2010, and will be visible from the South Pacific and parts of South America. That dose of totality will last no longer than 5 minutes and 20 seconds. The continental United States isn't due for a total solar eclipse until Aug. 21, 2017, but on that day, the track of totality will stretch from Oregon to South Carolina. Apollo astronauts look ahead ... to Mars? WASHINGTON - The astronauts who first landed on the moon aren't dwelling on their small lunar steps. Instead, two of them on Sunday urged mankind to take a giant leap to Mars. In one of their few joint public appearances, the crew of Apollo 11 spoke on the eve of the 40th anniversary of man's first landing on the moon, but didn't get soggy with nostalgia. They preferred to talk about the future and the more distant past. On Monday, the three astronauts will get another chance to make the pitch for a Mars trip, this time to someone with a little more sway: President Barack Obama. They got a pitch for Mars from the second man to walk on the moon, Buzz Aldrin. He said the best way to honor the Apollo astronauts "is to follow in our footsteps; to boldly go again on a new mission of exploration." Aldrin said trips to the moon should be seen only as a "steppingstone" to wider travels, including flybys of comets and asteroids (such as Apophis, an asteroid that is due to come close to Earth in 2029 and just might collide in 2036). He laid out a detailed timeline that would lead to Mars landings by 2035. "I believe we deserve to do a little bit more than footprints on the moon. ... I believe we can do that," Aldrin said. Then he followed up by quoting Obama's campaign slogan: "Yes, we can." The first man to walk on the moon, Neil Armstrong, discussed Apollo 11 for only about 11 seconds. He gave a professorial lecture titled "Goddard, Governance and Geophysics," looking at the inventions and discoveries that led to his historic "small step for a man" on July 20, 1969. Armstrong pointed out that American rocket pioneer Robert Goddard's invention of the liquid-fueled rocket eventually led to Nazi Germany's use of V-2 rockets as instruments of war. That, in turn, led to the arms race between the United States and the Soviet Union. Amid the Cold War, the International Geophysical Year of 1957-58 sparked Sputnik and the space race that followed — with the moon landing as President John Kennedy's chosen finish line. He said the space race was "the ultimate peaceful competition: USA versus U.S.S.R. It did allow both sides to take the high road with the objectives of science and learning and exploration." Armstrong's bottom line was that science, statecraft and military policy had to come together to produce his "one small step." Would humans have explored the moon if it weren't for Goddard, the challenges of governance and the International Geophysical Year? "Perhaps," Armstrong said, "but certainly never on the schedule as it actually occurred." Apollo 11 command module pilot Michael Collins, who circled the moon alone while Armstrong and Aldrin walked on it, said the moon was not interesting, but Mars is. But Collins spent most of his time reflecting on Earth rather than on other worlds. Not even the famous pictures of our home planet as seen from space provide a true sense of its beauty from afar, he contended. "It doesn't sparkle like the real thing did," Collins said. In the 40 years since Apollo 11, Earth's population has grown from 3 billion to more than 6 billion, said Collins, who spent stints as a State Department official and the director of the National Air and Space Museum after his moon trip. He feared that a global growth agenda would not be "wise, healthy or sustainable" in the long run. "We need a new economic paradigm that somehow can produce prosperity without this kind of growth," he said. NASA is still marching toward a goal of returning to the moon of Armstrong and Aldrin and this time putting a base there. The current plan is based on building new rockets that the former NASA administrator called "Apollo on steroids," with an alternative — a derivative of the space shuttle — floating through the space agency. Although they didn't directly criticize NASA's current plans, Aldrin and Collins said the moon is old hat. Collins said he was afraid that NASA's exploration plans would be bogged down by a return visit to the moon. The buildup to Monday's 40th anniversary of the Apollo 11 landing has provided ample opportunities for former astronauts to reflect on the space effort's legacy. During a Friday night ceremony at the National Museum of the United States Air Force in Dayton, Ohio, 12 Apollo astronauts received the National Aviation Hall of Fame's "Spirit of Flight" award — and traded reminiscences as well. In Dayton, Armstrong recalled that gazing at the moon's surface as he took his first steps "was spectacular" but said he and Aldrin had little time to savor the experience. "We didn't rest hardly five seconds when we got a message from Mission Control, saying get on with the next item," he said. The last man to walk on the moon, Apollo 17's Eugene Cernan, also flew on the mission preceding Armstrong's, which was a dress rehearsal for the landing to come. He joked that his job on Apollo 10 was paint a white line to the moon that Apollo 11 could follow. "Everyone knew Neil could land on the moon, but we didn't have a lot of confidence Neil could find it," Cernan quipped. "I've been listening to that for 40 years, and this is not the time to change my position," Armstrong shot back, drawing laughs from the crowd. Charles Duke, who was at Mission Control for the Apollo 11 landing and later flew to the moon on Apollo 16, recalled the tension as Armstrong used the last of his fuel to find a suitable landing spot. "I can't say it was panic, but it was a lot of attention to detail in Mission Control," Duke said. "The fuel level is going down, down, down, and things are getting real tense." When there were only 30 seconds of fuel left, "it got dead silent." Aldrin told reporters that he still has the felt-tipped pen he used as a makeshift switch to fire up the engines that lifted him and Armstrong off the moon. The actual switch lever had somehow broken off, but Aldrin had a pen in his shoulder pocket that just happened to fit the hole for the circuit breaker switch. The circuit breaker held, the engines fired, and the two astronauts were on their way. "The pen and the circuit breaker are in my possession because we do get a few memorabilia to kind of symbolize things that happened," Aldrin said. During a book signing in Dayton, Aldrin said that landing on the moon was "the climax, maybe, of my life." "Landing is more important than walking around outside, despite what everybody wants to think," he said. "Landing opens the door to do everything else that had never been done before." Armstrong made an appearance. Armstrong. NASA's Spitzer Space Telescope has found evidence of a high-speed collision between two burgeoning planets around a young star. Astronomers say that two rocky bodies, one as least as big as our moon and the other at least as big as Mercury, slammed into each other within the last few thousand years or so — not long ago by cosmic standards. The impact destroyed the smaller body, vaporizing huge amounts of rock and flinging massive plumes of hot lava into space. Spitzer's infrared detectors were able to pick up the signatures of the vaporized rock, along with pieces of refrozen lava, called tektites. "This collision had to be huge and incredibly high-speed for rock to have been vaporized and melted," said Carey M. Lisse of the Johns Hopkins University Applied Physics Laboratory, Laurel, Md., lead author of a new paper describing the findings in the Aug. 20 issue of the Astrophysical Journal. "This is a really rare and short-lived event, critical in the formation of Earth-like planets and moons. We're lucky to have witnessed one not long after it happened." Mind you, the Earth-Theia collision was quite low-speed, as planetary collisions go. That was the trick, and it required rather special circumstances. Since humans first touched the moon and brought pieces of it back to Earth, scientists have thought that the lunar surface was bone-dry. But new observations from three different spacecraft have put this notion to rest with what has been called "unambiguous evidence" of water across the surface of the moon. The new findings, detailed in Friday's issue of the journal Science, come in the wake of further evidence of lunar polar water ice by NASA's Lunar Reconnaissance Orbiter and just weeks before the planned lunar impact of NASA's LCROSS satellite, which will hit one of the permanently shadowed craters at the moon's south pole in hope of churning up evidence of water ice deposits in the debris field. The moon remains drier than any desert on Earth, but water is said to exist on the moon in very small quantities. Finding water on the moon would be a boon to possible future lunar bases, acting as a potential source of drinking water and fuel. The moon rocks were analyzed for signs of water bound to minerals present in the rocks. While trace amounts of water were detected, these were assumed to be contamination from Earth, because the containers in which the rocks were carried had leaked. "The isotopes of oxygen that exist on the moon are the same as those that exist on Earth, so it was difficult if not impossible to tell the difference between water from the moon and water from Earth," said Larry Taylor of the University of Tennessee at Knoxville, who is a member of one of the NASA-built instrument teams for India's Chandrayaan 1 satellite and has studied the moon since the Apollo missions. 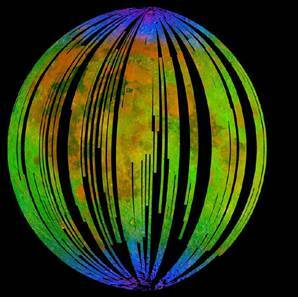 While scientists continued to suspect that water ice deposits could be found in the coldest spots of south pole craters that never saw sunlight, the consensus was that the rest of the moon was dry. But new observations of the lunar surface made with Chandrayaan 1, the international Cassini spacecraft and NASA's Deep Impact probe are calling that consensus into question. Scientists say the probes made multiple detections of the spectral signal of either water or the hydroxyl group (an oxygen and hydrogen chemically bonded). Chandrayaan 1, India's first-ever moon probe, was aimed at mapping the lunar surface and determining its mineral composition. In August, the orbiter's mission ended 14 months prematurely due to an abrupt malfunction. But while the probe was still active, its NASA-built Moon Mineralogy Mapper, also known as M3, detected wavelengths of light reflected off the surface that signaled the chemical bond between hydrogen and oxygen — the telltale sign of either water or hydroxyl. Because M3 can only penetrate the top few millimeters of lunar regolith, the newly observed water seems to be at or near the lunar surface. M3's observations also showed that the water signal got stronger toward the polar regions. Archived data from Cassini, which passed by the moon in 1999 on its way to Saturn, provided confirmation of this water/hydroxyl signal. The water would have to be absorbed or trapped in the glass and minerals at the lunar surface, Roger Clark of the U.S. Geological Survey wrote in a study detailing Cassini's findings. The Cassini readings show a global distribution of the water signal, though it also appears stronger near the poles (and low in the lunar maria). Finally, the Deep Impact spacecraft, as part of its extended EPOXI mission, made infrared detections of water and hydroxyl as well. Those observations were made at the request of the M3 team, as part of a calibration exercise during several close approaches of the Earth-moon system en route to its planned flyby of Comet 103P/Hartley 2 in November 2010. Deep Impact detected the signal at all latitudes above 10 degrees N, though once again, the poles showed the strongest signals. With its multiple passes, Deep Impact was able to observe the same regions at different times of the lunar day. At noon, when the sun's rays were strongest, the water feature was lowest. The feature was strongest during the lunar morning. The findings of all three spacecraft "provide unambiguous evidence for the presence of hydroxyl or water," Paul Lacey of the University of Hawaii said in an essay accompanying the three studies. Lacey was not involved in any of the missions. The new data "prompt a critical reexamination of the notion that the moon is dry. It is not," Lacey wrote. Combined, the findings show that the moon's hydration process is a dynamic one, driven by the daily changes in solar radiation hitting any given spot on the surface. There are potentially two types of water on the moon: icy material brought from outside sources, such as water-bearing comets striking the surface, or water that has its source on the moon. This endogenic water may arise from the interaction of the solar wind with moon rocks and soils. If the charged hydrogens, which are traveling at one-third the speed of light, hit the lunar surface with enough force, they may break apart oxygen bonds in soil materials, said Taylor, the M3 team member. Where free oxygen and hydrogen exist, there is a high chance that trace amounts of water will form. The various researchers also suggest that the daily dehydration and rehydration of the trace water across the moon's surface could lead to the migration of hydroxyl and hydrogen towards the poles, where it can accumulate in the cold traps of the permanently shadowed regions. Huh. Quite literally, water from a stone. How about that. But we still haven't figured out that blood from a turnip thing yet.